Artists Comments: On this study I focused on capturing a lava reef with waves breaking across it and shallow pools of water collecting throughout. Tide pools reflect the sky color while deeper water appears transparent and reveals the reef below the surface. Another challenge for me was to give the perception of a sharp rock face and the elevation change between sea-level and the rock surface. 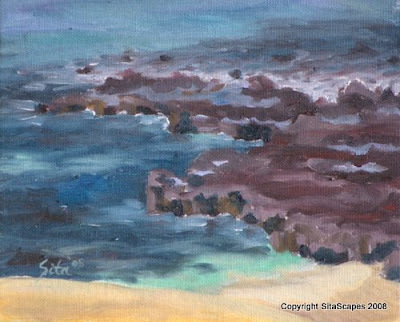 This painting represents so much of what the Big Island's shoreline looks like: lava, ocean and reef.